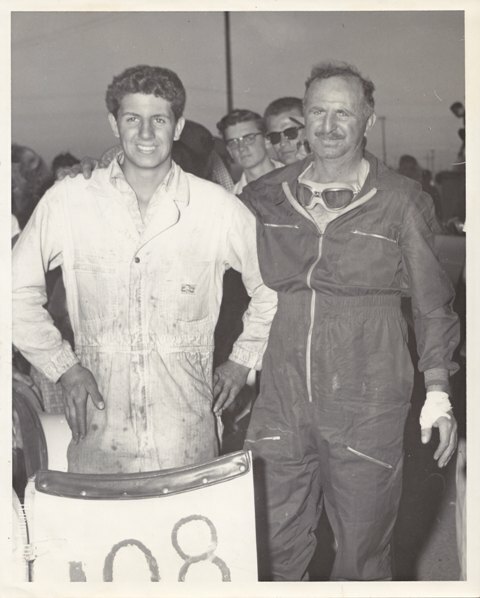 Arcata, CA based racer Brero, shown here with his son, Lou Jr. raced some great cars and was prominent in West Coast racingin the mid-1950s. I've heard that Mr. Brero Sr. raced in Europe before he emigrated to the U.S. If anyone has any information on his earliest racing career: Please email me! "At 16-17 my Uncle and Dad worked the SCCA equipment truck and I was allowed to be part of it. Lou Brero was one of my heroes. Always had a big grin, especially when he'd screwed up. At Sacramento in 1957 he spun the D-Jag at over 100 on the straightaway, never slowing down. At Cobb Mountain Hill climb he wrecked a borrowed Maserati, came into our turn with a full grin, then crashed head-on into a hay bale. At Arcata, as we were setting up the course markers, he roared by in a lumber truck, driving it for all it was worth. That race was his personal baby as it was in his home town. If he didn't drive in Europe in his younger days, his helmet had to have as it was one of the old type and pretty grimy. Odd how things like that stick in one's memory. Thanks for the new pics, they were of my time." "I came across the August 1956 race program for the Redwood Sports Car Race at Arcata Airport and inside was this brief bio of Lou Brero. Thought you might be interested as it contains a few good tidbits including a reference to his European Hillclimb racing. I would assume the information is accurate since this was Brero's home town race." Next: Whitey Thuesen's Amazing "Solitary W asp"